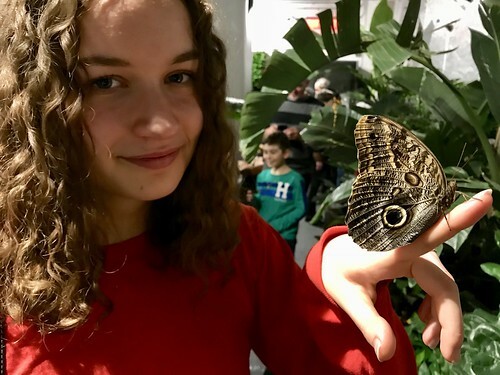 For a few years, many moons ago, the kids and I were regular visitors at the annual live butterfly show at Carleton University here in Ottawa. I thought it was a great way to introduce kids to the magic, beauty, and joy of these amazing creatures. 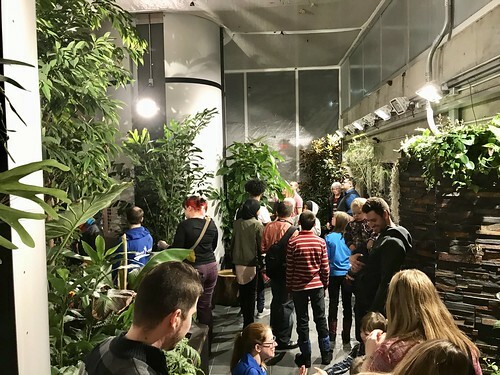 So when I heard about the new live butterfly exhibition at the Canadian Museum of Nature,* I knew it had to be something we had to check out as a family. Imagine a large circular greenhouse with a high ceiling, filled with all kinds of greenery and tropical plants. The heat and humidity are cranked up to create a comfortable habitat for the resident butterflies. As an added bonus, this warm cocoon of a room (ha! pun intended) makes a very pleasant respite from the horrific cold snap we’ve been surviving had in Ottawa recently. There are food and drink buffet stations set up for the butterflies around the perimeter of the room (think: dishes of oranges). 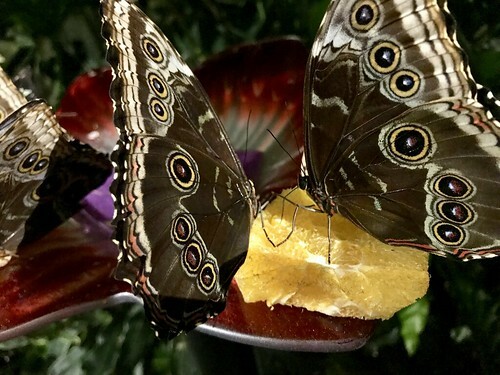 These turned out to be the ideal places to see the butterflies in action. We all leaned in to take a good long look and, of course, take a million photos. As I walked around I realized that I was playing the ultimate game of iSpy. It was very cool. Visitors are instructed to move slowly and watch where they step. Good advice, for sure. It was all very relaxed, which I appreciated. There’s a staffer on hand to chat with people and answer questions. There is a lot to learn about these amazing creatures. Scientists STILL don’t fully understand what happens during metamorphosis, but they do know that the caterpillars essentially digest themselves while they’re in their cocoons. Neat, eh? While we were there, I watched two young school-age siblings who each had a small live butterfly on their shoulder. They were VERY proud and extremely gentle. It was so sweet. I wondered how they’d remember this later. What if this was the moment they decided to become biologists, climate change experts, or entomologists? On the way out we checked ourselves for any hitchhiking butterfly specimens before eventually going back out into the cold winter evening, happy that we got to hold a bit of magic in our hands and see it up close, even for a moment. 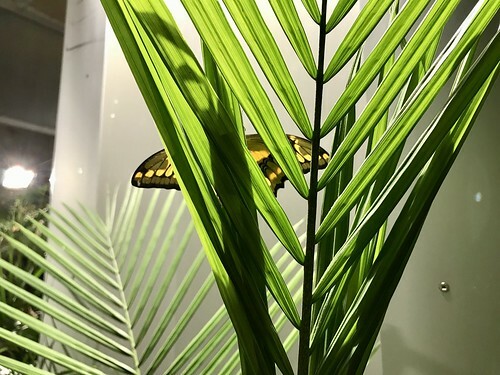 * I was given tickets to see the butterflies by my friends at the Museum of Nature but was under no obligation to post anything about it here. All my views are my own! Please note that the museum is closed from January 8 to 12 (inclusive) for annual maintenance. 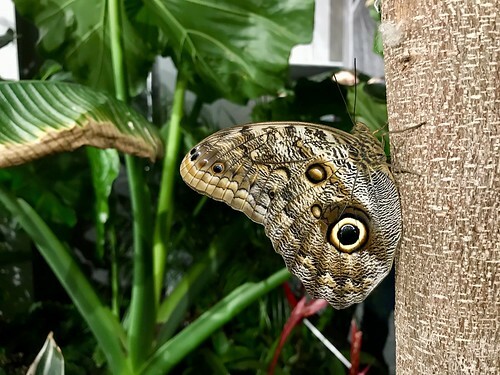 Share the post "A peek inside the live butterfly exhibition at the Museum of Nature"
2 Responses to "A peek inside the live butterfly exhibition at the Museum of Nature"
OOHHHH! So awesome! It reminds me that we have a Butterfly House here in Dallas at the Texas Discovery Gardens. The boys went on a field-trip there when they were in Pre-K and enjoyed it. I think that is going to be a home school field trip this spring!